Since America’s founding in 1776, the arts have been representative of American culture. 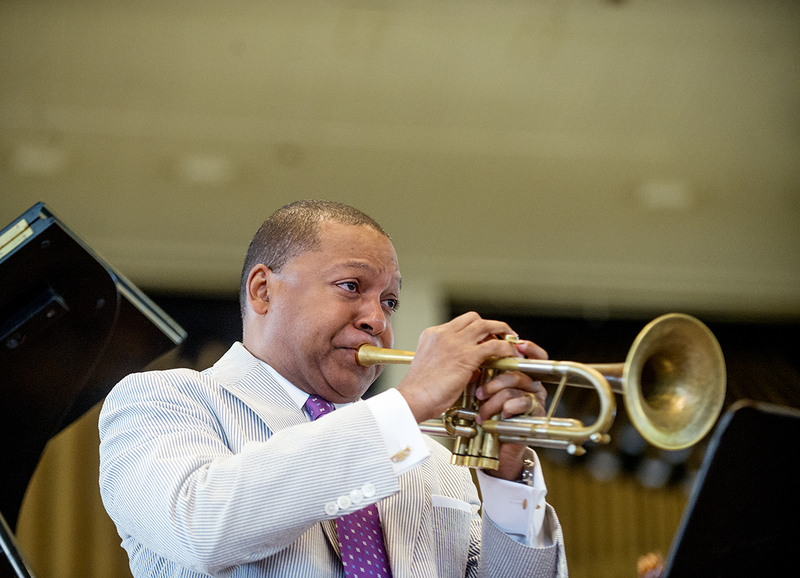 The tempo of music runs through the United States, connecting it in a way nothing else can, Wynton Marsalis said. A nation torn apart by politics and race and identity can be restored through the freedom the arts bring — a freedom that teaches the American people who they are. 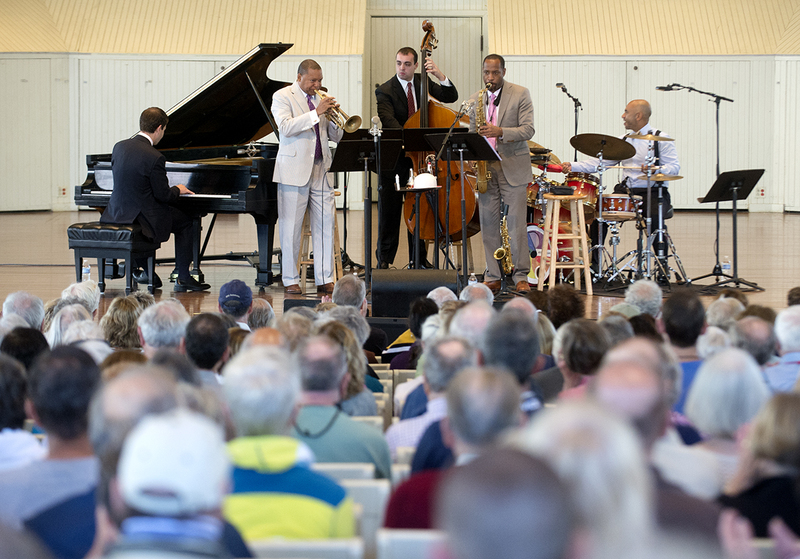 Marsalis, the artistic director of Jazz at Lincoln Center, discussed how the homegrown American arts allow individuals to see how they are connected through arts and tells them who they are. Today, Marsalis said individuals hear about gun control, immigration, jobs, housing, finances, discrimination and corruption on a daily basis. 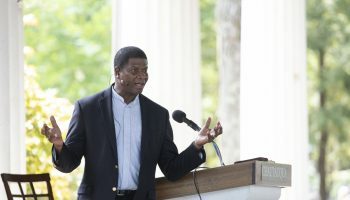 The list of turmoil and political conflicts continue, and Marsalis said one thing that is never discussed is culture and the arts. Wynton Marsalis, artistic director of Jazz at Lincoln Center, performs on the Amphitheater stage during his lecture “The Ballad of the American Arts” Monday, Aug. 22, 2016. The Constitution was designed to be flexible by allowing it to be changed through amendments. It brought together people who, despite their diverse background, all have a common desire for freedom. Marsalis said James Madison, John Adams and Thomas Jefferson taught society how to negotiate differences. He compared this to the way a dance band adjusts to find the right tempo for different groups of people. 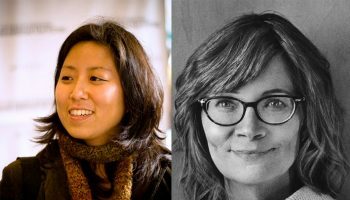 A cultural engine runs the United States through the homegrown arts that developed in the country over the past 200 years, which has shaped society and government. Jazz created a community of people who followed the same American objectives detailed by Jefferson, Adams and Madison more than 150 years prior to the creation of jazz music. Besides jazz music, Marsalis briefly touched on the literary arts. He said Edgar Allen Poe was writing the blues long before the blues was born, and Harriet Beecher Stowe wrote about the lives of slaves in Uncle Tom’s Cabin as a prelude to the civil rights movement. Uncle Tom’s Cabin made people aware of the lives slaves led and how they are human, too, despite what plantation owners and citizens wanted to believe at the time. Marsalis said American arts speak a distinct truth that breaks down barriers across class, race and gender. 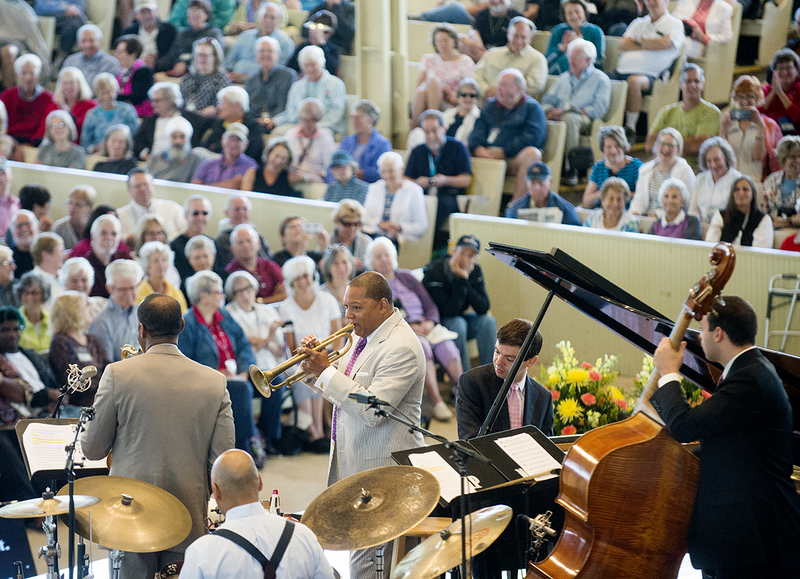 Marsalis began to sing “Joshua Fought the Battle of Jericho,” and a low hum spread across the audience as Chautauquans sang along quietly. He said the act of joining in showed music stretches across times. During the Civil War, the Confederates marched to the song “Dixie,” which was written in 4/4 time, and the Union Army marched to “The Battle Hymn of the Republic,” which is in 6/8 time. Marsalis and his quartet of musicians demonstrated the clash of the two time signatures, and how easy it could have been for the Union Army to switch time signatures. As they played “The Battle Hymn of the Republic,” the song shifted into Sousa’s “The Washington Post March” to “Didn’t He Ramble,” a New Orleans parade anthem, to the Mickey Mouse theme song as they switched from 6/8 time to 4/4. Marsalis said American culture was created by a mixture of background and heritage the American people held — Jewish, black, blues, improvised, syncopated.